Image caption The Prison Officers' Association said the 23-year-old officer was "lucky to be alive"
Police were called at about 10:00 BST on Sunday after what union officials called an "unprovoked attack" by a prisoner with a razor blade. Michael McKenna, 25, has been charged with grievous bodily harm with intent, wounding with intent and a racially aggravated public order offence. 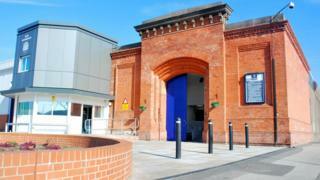 He will appear at Nottingham Magistrates' Court later. Prison Officers' Association national chairman Mark Fairhurst said the prison officer was "lucky to be alive as it [the wound] was very close to the main artery on his neck."